Art Gallery » On day, we’ll come back! On day, we’ll come back! 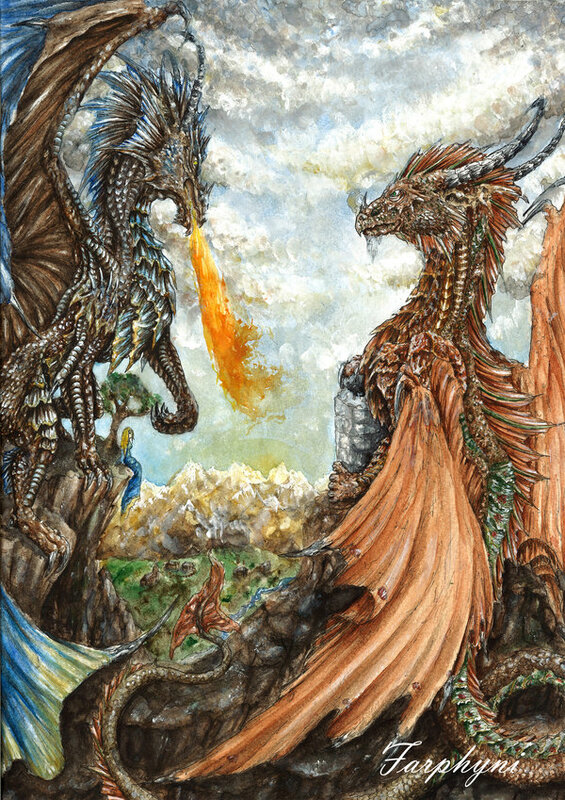 Though this artwork features two dragons that are part of the first book of the trilogy I’m working on, this story has nothing to do with the books. Once upon a time, powerful and wise creatures visited the earth, called dragons. They all liked this world and didn’t want to harm anyone or anything, they wanted to live in peace with the other creatures of this planet. Then they meet the humans and for while they lived in peace together. But the humans were afraid of the dragons and when they realized that the dragons are harmless, they got smug and so all the humans came togehter and decided to defeat and kill or subjugate the dragons. The war between these two races lasted for years and there were lots of dead people and also dragons. So the council of the dragons decided to leave this world, to prevent more dead ones. On the day of the departure a young woman came to the dragons lair. She wasn’t afraid of the dragons, which claws were twice as large as herself. And the dragons were interessted in this young woman, which was so diffrent from the other humans, so they didn’t harm her. She bowed in front of the leader of the dragon-group and asked if she could come with them. All dragons were surprised and they started discussing. Suddenly two dragons ,which were best friends since they were hatched, went to the leader and they said that they would take care of the woman. The wife of the leader looked furious at the woman, “Your race killed so many of us! Tell why we should give them another chance! tell why we should give you a chance!”. The woman looked calm at the leaders wife and answered, “Not all of us are bad. Everybody and every race should deserve a second chance. I’m sure that there are also some bad dragons. In every races are bad and good creatures and also some creatures which are between that.” The leaders wife snorted, but thought about the womans words and finally nodded, “Ok.” Then she looked at her husand. The leader looked at first at the woman and the to his dragon-group, “my friends. We are going to leave this world now, but the woman is right,… we’ll give the mankind a second chance. We’re going to watch them…and if we see that they remedy, we’ll come back.” His group agreed and so the leader opened a portal. In a row the dragons went through the portal. The human woman looked at the two dragons, which said that they’ll take care of her, “Thank you so much!” One of them smiled, “No Problem, human. Since I saw you, I knew that you are different.” He took her carefully and put her on his head. The three creatures turned around and looked at the landscape for some seconds. Then they went through the portal and left the world forever.